Grand Palm is one of the first residential property developments in the master-planned West Villages in northeast Venice. This community was developed starting from 2012, eventually emerging amongst the most sought-after destinations for prospective buyers of Venice homes for sale. The developer of Grand Palm is a leading regional builder, Neal Communities. It earlier had this community approved under the Sarasota 2050 economic initiative, also notably one of the first projects to get approval under this forward-looking plan of the county. Grand Palm occupies a 1,005-acre site in West Villages at the southwestern corner of Center Road and River Road. Its location is likewise convenient to several major road corridors, such as Interstate 75, East Venice Avenue, and U.S. 41 (Tamiami Trail). Neal programmed this community for close 2,000 residences, the largest project in the company’s 40-year history. Neal masterfully developed Grand Palm to preserve about one-third of its acreage as open space teeming with lush trees and foliage. 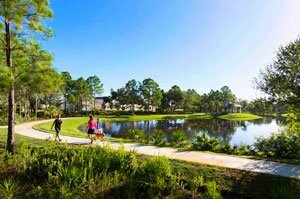 This community’s major features likewise include an expansive Adventure Lake with an eight-acre private wooded island at its middle. Miles of trails weave within the community including stretches around the 39-acre main lake and into its charming island called Lookout Point that also serves as a base for fishing and boating. Another activity center in this community is its Palm House featuring a recreation area and a fitness facility with state-of-the-art equipment. This clubhouse likewise provides resort-style pool with water slides. In addition, it has a fitness pool for lap swimming and water aerobics. Facilities for tennis, basketball, volleyball, baseball, bocce and kickball are also amongst Grand Palm’s amenities. The community likewise offers an adventure playground, a children’s splash park, and two dog parks—Big Bark and Playful Paws—to further enhance the market appeal of Grand Palms homes for sale. Largely because of these winsome features, the magazine Where to Retire named Grand Palms as one of its 2017 choices for the top 50 master-planned U.S. communities. Nine other Florida residential developments were included in this list. Grand Palm’s superb makeup extends to the rich mix of residential options in this community. Besides single family homes and cottage-style residences, maintenance-included villas are also part of the inventory of Grand Palms homes for sale. Neal has continued to expand this development’s home choices, introducing six single family home models and two villa designs during the second half of 2017. Market activity for Grand Palm villas in 2017 were recorded for builds priced in the $200s‒$300s range, featuring floor areas of about 1,500 square feet designed with two bedrooms and two baths. Typical sales listings of single family homes in this community have price quotes between the high $200s and the $700s for residences with floor plans of up to over 3,000 square feet featuring up to four bedrooms. 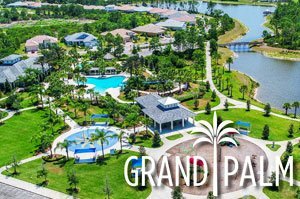 With its wide home selections, Grand Palm consistently counts as one of Neal’s top-selling communities as seen in its 20 homes sold for November 2017 alone. Further plans to develop the West Villages area, which includes a new Town Center and the spring training camp of the Atlanta Braves, are helping fuel demand for Grand Palm Homes for sale. Easy access to downtown Venice, the Gulf Coast beaches and the lifestyle attractions of Sarasota count too amongst the pluses of living in Grand Palm at West Villages. Below are the current real estate listings available at Grand Palm.